Photo: Paul Wellman At the new Target, customers complain that cars circle the parking lot and sometime wait on La Cumbre Road. For want of a grandkid’s bathing suit, Michele Jackman found herself trapped in Target’s parking lot several times Saturday night. “I pulled into the Target lot,” she said, “and five cars were lined up. Others were coming in the State Street entrance. And people were stopped to wait for a parking spot!” It was 8:30 p.m. at a store that stays open until 11 (every night except Sunday), and as the community has predicted, parking was an issue. Next door at La Cumbre Plaza, where the giant Sears store just closed, signs were posted that parking was for customers only. 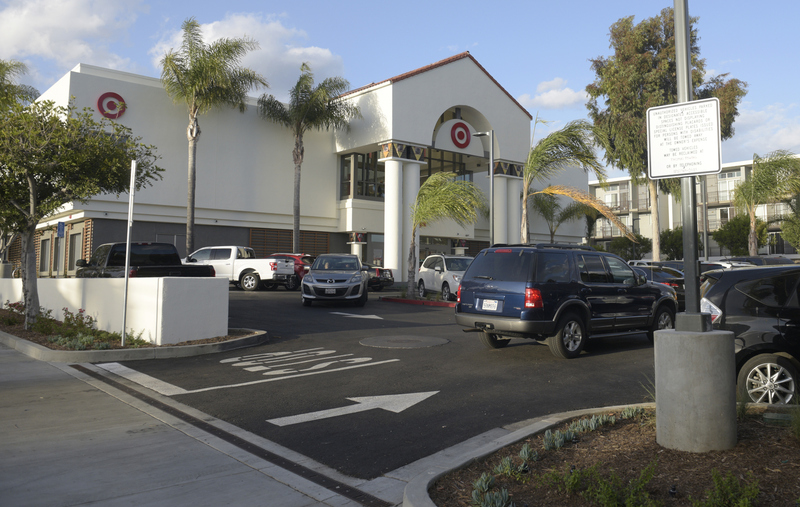 Target shoppers parking near Panera or Macy’s were “a big problem. It’s a bit overwhelming,” said a security guard before a squawk over his radio pulled him away from the conversation. The Target lot has 91 spaces, and the sales team has more than a dozen to use at a different lot nearby. City transportation engineer Derrick Bailey said they knew the opening period would be very popular, but they also think the congestion will die down once people have had their first glimpse of the new store. To help keep traffic moving, Bailey has been watching the traffic sequencing and adjusting the timing of the green lights and left-turn arrows. On La Cumbre Road next to Target, two lanes now turn left, one goes straight, and one turns right. Photo: Paul WellmanTraffic lights have been timed to decrease the wait near Santa Barbara’s new Target. On Monday afternoon, a delivery truck was parked in the right-turn lane as the driver quickly dollied boxes of potato chips into the store. Inside the parking lot, which had empty spaces, drivers waited for the right spot, ignoring the backup behind them. Jackman said she’d seen cars backed onto La Cumbre Road out of the parking lot, which Bailey confirmed was happening. Jackman said her grand-daughter didn’t find a swimsuit in the right size that night, and she felt a little ridiculous going through the parking hassle for just a bathing suit. But the issue concerns her: “They keep doing projects on upper State and adding housing, and there’s no parking,” Jackman said, speaking of three multi-unit housing projects near Target: Estancia, Grace Village, and The Marc. “I know it’s about housing density, but there are plenty of minds at the city that are dense about this,” she added, laughing.